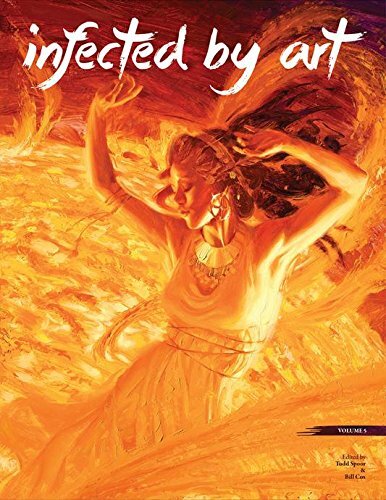 The latest volume from Infected by Art is out. This is volume 5. At the time of this review, the submissions for Volume 6 has just ended so you can expect another volume next year as well. Oh, the copy that I have was sent to me by Bill Cox, one of the editors for the book. The other editor is Todd Spoor Thanks! Infected by Art is an online art community where artists share their artwork in galleries, or participate in competitions (one of which is the artbook competition). The quality of work showcased on the website is fantastic. There are lots of professionals there. The 5th volume is a hardcover with 328 pages. The binding for the book is a bit weak so be extremely careful when handling it. It seems like the first and last pages are glued that well to the spine and covers of the book, so they may actually tear away from the spine, so be careful! The stitching is fine though, and you can open the book relatively flat. The jurors for this volume are Bob Eggleton, Craig Elliott, Forest Rogers and Marc Scheff. There are quite a lot of winners because there are several categories. Winners for the grand prize are Vanessa Lemon, David Palumbo, Matt Smith, Vince Natale and Travis Lewis. Winners of the Traditional Painting category are David Palumbo, Donato Giancola, Vanessa Lemen, Todd Lockwood and Linda Adair. Winners for the Digital Painting category are Jeremy Deveraturda, Bastien Lecouffe Deharme, Stephan Martiniere, Jake Murray, Ed Blinkley. Winners for the drawing category are Travis Lewis, Matt Smith, Jeff Echevarria and Allen Williams. Winners for the Sculpture category are Thomas Kuebler, Dug Stanat, Colin and Kristine Poole. The artworks featured are terrific. It must be difficult to pick the winners. The quality of art is top notch and there is no doubt that all the artists are very technically accomplished. Most of the artworks seem to be fantasy art based as compared to sci-fi art, and many have characters so we don't see any landscapes or concept art that sort of art. It's a delight to go through all the artworks. In the Digital Painting category, I couldn't even tell that many of those paintings are digitally created. The Drawing category features mostly pencil drawings. And the Sculpture category gives us a look at some pretty awesome 3D sculpts. It's great to see so much creativity involved, to see the different concepts and ideas by different artists. It's certainly an inspiring book with so many pieces of high quality artworks included. I can easily recommend this book, but just be careful of the binding. You can get this book from Amazon or from the online store at Infected by Art. The IFA online store is selling earlier volumes at pretty good prices. That's the binding issue I was talking about. Binding doesn't look too bad when book is closed. But don't hold it by the spine with the page edges facing down. I was told this binding problem affects some advanced copies and later copies are fine.